It’s a common computerized conundrum: the latest software is out, but is it what you want? Is it something IT will approve and support? Should you switch from your reliable, existing program to the flashy, new, exciting, and supposedly “upgraded” version? Take the recent release of Microsoft Office 2016 for the Mac. If you use Microsoft Excel you will now need to consider using Microsoft Excel 2016 for Mac versus Excel 2011 for Mac. Is giving up the comfort and familiarity of your current program worth it? Is the grass really greener on the other side? These are all legitimate concerns, especially for busy executives who can’t risk losing time or money fiddling with sub-par software. Microsoft Excel 2016 for the Mac caused a lot of upset in the Excel community. Based on expectations, it was not what it was supposed to be, according to the Mac Excel experts. Microsoft actually removed functionality, making it a lesser product, one that is more of a challenge to program VBA. Here is a partial list of the problems with Mac Excel 2016. This is a perfect example of should I upgrade or should I wait. At Excel Consultant, our Microsoft maestros are here to help you through every season of software. Our team of tech experts analyzes the latest software developments to help our clients determine if transitioning is the right choice. With decades of experience consulting, coding, and customizing Microsoft software, we know exactly what to look for from each new release. How does Excel 2016 stack up against Excel 2011 for Mac? How does Excel 2016 stack up against Excel 2011 for Mac? Learn the pros and cons of this newer software from Excel Consultant’s team of Microsoft masters. In the following blog, we compare Excel 2016 versus Excel 2011 for Mac. Read on to find out what’s changed, how this could impact you, and which might be best for your needs. Excel 2016 for Mac is a component of Microsoft Office 2016, which was released on July 9, 2015. As with all Microsoft programs, this software regularly undergoes updates, but has largely remained the same since mid-2015. Microsoft Office 2016 comes in three versions: Office 365 Home, Office 365 Personal, and Office Home and Student 2016 for Mac. The Office 365 versions are cloud-based and include a few more features, but all include Excel 2016. The last release of Microsoft Office for Mac prior to 2016 was in 2011, which is why we’ve chosen to compare these two. Overall, as in keeping with the general overhaul of Microsoft Office 2016 for Mac’s design, Excel 2016 has a much more streamlined interface. These functions offer some benefits to users, especially if your goal is an aesthetic interface, easier searching, and more automated analyses. 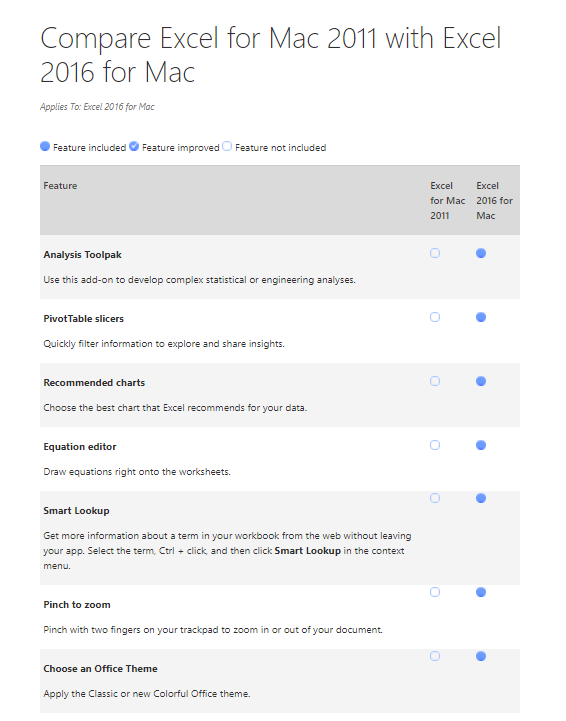 Excel 2016 isn’t without its merits, but Microsoft removed key features from this software when moving from the 2011 model to the current program. These gaps are why many users have chosen to remain on Excel 2011, and why we often recommend this option for our clients. 1. Shortcuts. In an effort to make Excel 2016 “easier” to use, Microsoft altered and/or removed many of the hotkey combinations Excel aficionados have grown accustomed to over the years. While this problem is fixable (you can program your own personalized shortcuts or simply get used to the new ones), it’s a definite hassle, and may outweigh the relative advantages of Excel 2016 over 2011. 2. Macros. This is the major problem with Excel 2016, from a programming perspective. Macros allow you to automate complex, repetitive actions in Excel, cutting down your coding time significantly. Unfortunately, in Excel 2016, they’ve been all but eliminated. 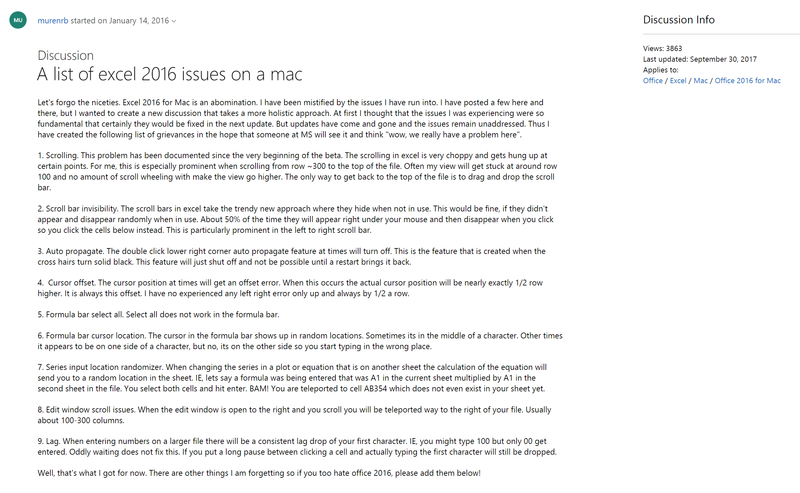 As a Microsoft forum Community Moderator explains in his reply to a confused Excel 2016 customer, “Microsoft cut the Visual Basic Editor [the tool needed to create macros] from Office for Mac down to practically nothing at all…The Microsoft expectation now is that you will use Office 2011 for Mac…as your development platform,” only making small adjustments with Excel 2016, if it cooperates at all. This has been such a significant issue with Excel 2016 that Microsoft has pledged to return this feature in the next iteration of Excel, but there is no set release date for that software. As it is now, limited macro functionality drastically reduces the workability and usefulness of Excel 2016, since macros are how many advanced Excel programs run. Macros are a cornerstone of Excel Consultant’s customized solutions; they’re often how our advanced team programs your software to meet your specific needs. As a vital component of Excel, virtually removing macros from the 2016 software is a critical blow in many cases. These are pivotal pitfalls in Excel 2016, and two important reasons why you might choose to stick with the 2011 program. • You don’t rely on macros (most enterprises do, or should). • You don’t tend to use shortcuts (or are willing to relearn/reprogram them). • You care a great deal about the appearance of your interface. • You’re looking for quick, simple automation in data analysis rather than more intricate interpretations. • You often conduct online searches while working in Excel and don’t want to shift back and forth between your browser and the software. Otherwise, in terms of sheer programming power, we’d advise staying with Excel 2011, or at least keeping it running alongside Excel 2016 so that you can use macros. 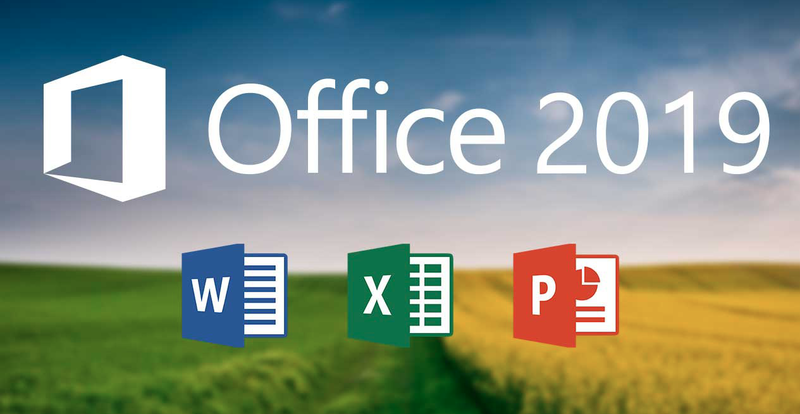 While 2016 for Windows and the Mac have been out for a while now you do have a new consideration to make, Office 2019. Microsoft Ignite in Orlando, we announced Office 2019—the next perpetual update for Office. This release, scheduled for the second half of 2018, will include perpetual versions of the Office apps (including Word, Excel, PowerPoint, and Outlook) and servers (including Exchange, SharePoint, and Skype for Business). Currently it is unknown if Microsoft will also release a Mac version under the name Office 2019, though there have been remors. If there is, it would be welcomed as Mac Excel 2016 is a lemon. Presumably, Microsoft will offer different versions of Office 2019 (including a version for the Apple Mac), but executives didn’t say. Or the Services we Offer: Interested in learning more about these programs? Still not sure which one to choose? Excel Consultant can help! We offer consulting, programming, training, and more. Contact us today to schedule an appointment. A full and Lengthy Post: Compare Excel for Mac 2011 with Excel 2016 for Mac, on the Microsoft Website. Posted on October 13, 2017 Posted in Blog Category and tagged Experience, Document, Programming, Learn, Consulting.